In year 1900 the Coleman Company was first introduced to the world after they incorporated, but not as a camping and sporting goods manufacture. Instead, the company opened under the name of the Hydro-Carbon Light Company, manufacturing lanterns that were later named after W.C. Coleman. It wasn’t until 1909 that the first and famous Coleman Lantern was introduced. 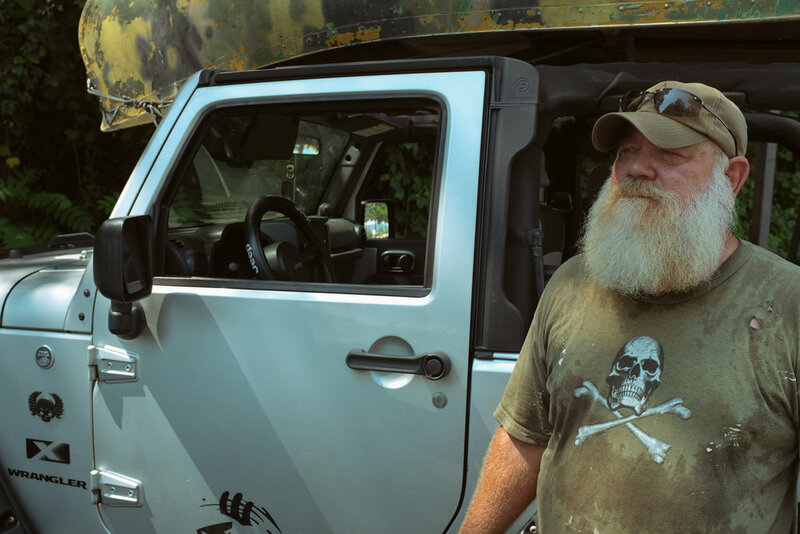 The company went on to manufacture everything from cooking stoves to canoes, like the one you see on this Jeep belonging to Brian Burgess. Burgess, who is an archaeologist, totes his 1958 Coleman canoe with him on a regular basis. The day I ran into him, he was about to load it into the Tennessee River in Chattanooga. Such canoes made out of aluminum were manufactured for the first time directly after World War II. Many outdoor enthusiast switched over from wood canoes to aluminum during that time period because they were so low maintenance and quite durable. While digging for gold may sound more glorious, Burgess prefers to dig for history. He has searched the country far and wide for interesting finds. “Anywhere that there is high ground and walking distance to water, there has been man,” he told me while basically suggesting that history can be nearly anywhere. Originally from the Lone Star State Burgess said that his grandfather, who is 100 years old today, sparked his search for treasures. He said that his grandfather took him exploring as a kid when he was only 4 or 5 years old. “We’re keepers of time,” he stated while talking about the importance of archaeologist. “I also collect dinosaur bones,” he said while talking about how the bones will wash up along the banks of the Brazos River in Texas. The Brazos is the 11th longest river in the United States, which means it passes through lots of history. The Brazos was also where a scene from the battle between the Texas Navy and Mexican Navy during the Texas Revolution took place. It was also an important navigational voyage during the American Civil War. So, depending on where you are on the river, you may just be lucky enough to come across something interesting. Not everything Burgess comes across is for keeps. In fact, he has given valuable artifacts to multiple museums. He suggested that history sometimes finds him, so he passes it along to allow others to share in the find.